This picture shows there was no difference between women and men riding in China in this time. 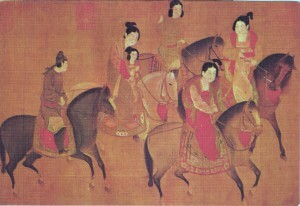 The three women are accompanied by two men, but there is no difference in style or activity. The woman in the middle has a little child sitting in front of her, which she keeps between her arms. The reason why she takes her child with her is no doubt that she wants to accustom the little girl to the movements of the horse. This first acquaintance with horse riding is still practised by mothers/riders in our days. The horses all have a rather heavy build but fine legs. They will be related to the Mongolian pony but bred in a stud where a careful selection was made to develop the present type.